Interested in learning how to oil paint? Oils are one of the trickiest mediums to learn how to use on your own, but with the right instruction you can learn how to paint with oil at your own pace, from the comfort of your own home. There's no better teacher than Classical Realist painter Delmus Phelps. 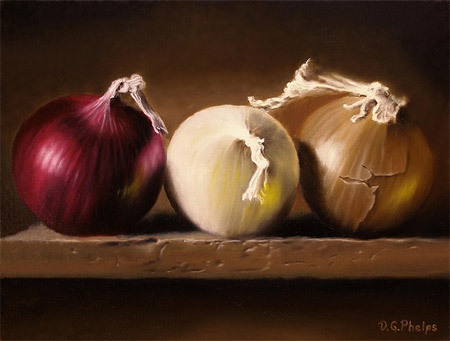 Take a look at his still life oil paintings on this page and you'll agree that he knows how to handle oils like a master! Disclosure: If you purchase Delmus' e-book after clicking on a link from this site, Delmus will send me a commission as a way of saying thanks for recommending his how-to oil painting book. But as you'll see below, I wouldn't be recommending this course if it wasn't a fantastic entry to oil painting! Delmus offers a detailed, 142-page e-book that explains how he creates his remarkably realistic still life oil paintings, from start to finish. Packed with photographs for every step of the process, Delmus' book A Real Art Lesson provides everything a budding oil painter needs to know about how to create still life paintings in a Classical Realist style. I read A Real Art Lesson from cover to cover and I wholeheartedly recommend this e-book. I honestly learned more from his book than I did when I took an oil painting class my first year in college. A Real Art Lesson is filled with valuable information that you can only get from someone who deeply knows the ins and outs of painting with oils - such as which brushes to use when, how to create layers to make your painting have that gorgeous 3-D appearance, and so much more. I'll tell you more about the e-book's content in a second. First I want to show you some more of Delmus' artwork, so you can see how well he handles oil paints! These are just a few of Delmus' many oil paintings. 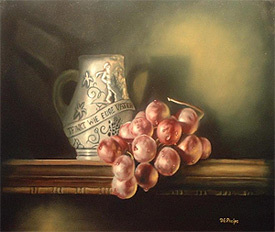 If you want to see more of his impressive still life oil paintings, check out his gallery of prints for sale. When it comes to learning how to oil paint, the knowledge of a skilled instructor is indispensable. One of the best ways to determine whether a teacher is worth your while is to look at his or her paintings. Are you immediately impressed by the artist's skill? Do you gaze at their work and wonder "How did they do that?!" Well, in Delmus' e-book he shows you exactly how he "did that"! A Real Art Lesson contains 142 pages full of important and useful oil painting techniques, covering everything you need to know about how to oil paint – from preparing the canvas to painting each layer to varnishing the finished painting. 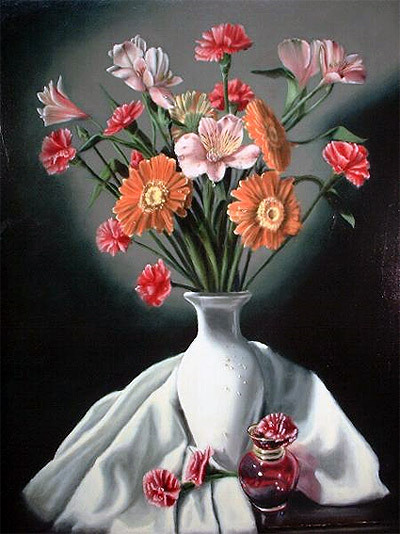 In this book, Delmus explains (through a balanced combination of words and photos) how he created 2 different still life oil paintings from start to finish. He reveals tricks of the trade – oil painting techniques that are not typically taught in today's art schools, which mostly seem to favor modern art techniques. Find out what this oil painting tool is for! When it comes to creating oil paintings, Delmus explains why craftsmanship is more important than 'talent'. 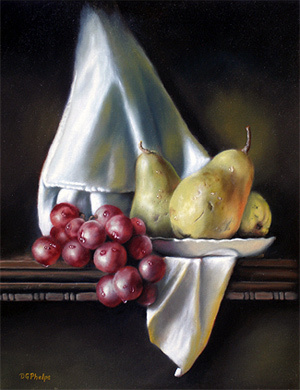 He believes that anyone can learn how to oil paint realistic still life paintings – you don't need any special talent, just the basic know-how that he provides in his book. Still life set-up: What kinds of items to choose for a still life, how to arrange the still life, everything you need to know about lighting, such as how to control the light in terms of direction and quality. Longevity: How to create properly-constructed artworks that will last for generations – oil paintings that won't fade, crack or peel. Priming the canvas: Why you should prime, what tools you will need, how to blend the exact mixture, how to apply the mixture, how to check for imperfections. Transferring your drawing: 2 methods for transferring your drawing onto canvas, along with what to check for after you've finished the drawing, in case you need to adjust some things. Imprimatura: What it is and why it is important, how to you apply it, how it should look when finished, how long it should take to dry. An important step: Find out what he's doing & why! Paint layers: What are the different layers of paint and what does each layer do? Which layer is the most important, why you need to paint each layer in a particular order, how you can tell if the canvas is ready for the next layer. Oiling the canvas: What it means to "oil" out the canvas, why it is important, how to do it, and what materials to use. Making masterful brushstrokes: How to create smooth transitions of shadows, highlights and colors to create depth, how to soften shadows, how to blend brushstrokes so that they 'disappear'. Mixing colors: How to mix colors on your palette, along with the correct ratios of colors needed to mix black, middle tones, and white. Plus, an explanation of when you'll need to use thicker, more opaque paints and when it's better to use thinner, more translucent paints. 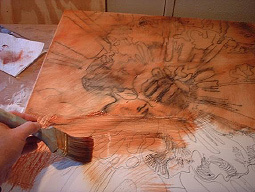 He rounds out the e-book with tips for beginners on blending oils on the canvas, making hard lines and making soft lines. Delmus also devotes several pages to showing you how to oil paint water drops - one of the eye-catching details that can really add a touch of sparkle to a painting, lending a sense of fresh timelessness to a realist still life. Just take a look at the water drops on his gorgeous white rose painting to the right, and you'll see what I mean! 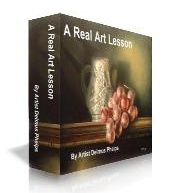 This e-book truly is "A Real Art Lesson" on how to oil paint. Delmus has created an in-depth, instructive e-book that explains, through both words and pictures, how to create a realist still life in oils. It was enlightening to follow the detailed steps of his progress and watch as his paintings came to life. The way this book is written, you can imagine Delmus standing by your side, patiently explaining each step you should take as you learn how to oi lpaint. 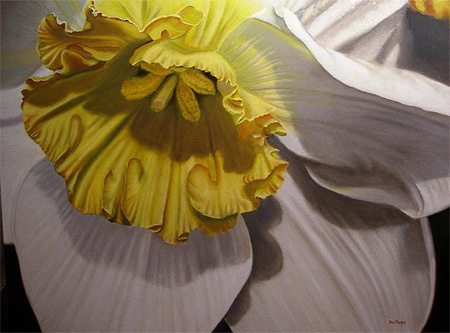 With his easygoing sense of humor and down-to-earth attitude, Delmus demystifies the process of oil painting, making it accessible to everyone interested in learning. As mentioned earlier, Delmus' e-book on how to oil paint is filled with plenty of useful photos that illustrate each step. Photos are an important part of any art instruction book, because artists are usually visual learners. But another benefit of all the photos in this book is that you can see how his paintings look at that 'awkward' stage that often discourages beginners. If you're painting on your own, you might think your painting looks weird and you can't understand how it can possibly go from that clunky in-between stage to the polished, perfect stage. So, one of the best things about progress photos is that they can relieve those worries. All paintings look awkward or clunky at some stage, so Delmus' e-book helps you confidently move on to the next step of the process. Is this e-book right for you? As good as any art book may be, not all books on how to oil paint are right for everyone. It all depends on what style you want to work in, what subject matter you want to paint, and what skill level you're at. Are you struggling with oils? Can't seem to make them work? Do you want to take your oil paintings to the next level, but don't know how? Do you want to make sure your oil paintings will last for generations? Do you want to create more realism in your work? 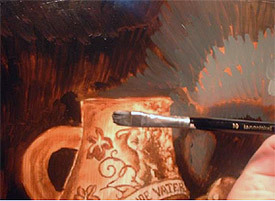 Are you simply curious about how a realistic oil painting is made? Do you want to learn a set of tried and true techniques that will help you accomplish all of the above? In short, A Real Art Lesson is ideal for people who want to learn how to oil paint in a Classical Realist style, similar to the Flemish masters whose works are valued all over the world. 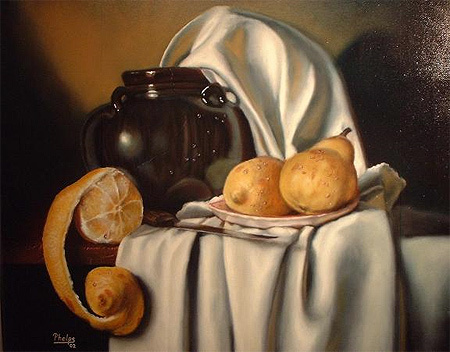 Delmus focuses on still lifes, but as you gain more experience with oil painting, you may be able to transfer some of his techniques into painting landscapes, portraits, and other types of realist paintings. If you're still not sure whether this e-book is right for you, you'll be comforted to know that buying Delmus' e-book is risk-free because he offers a money-back guarantee when the book is purchased through his website. Who should NOT buy this e-book? It's worth noting that if you want to learn how to oil paint in a Pop Art style, or paint still lifes with contemporary objects (such as candy wrappers, plastic toys, etc), then this book is not for you. Delmus focuses on Classical still life painting only, which means that the objects he paints are things you'd likely find in a Flemish still life painting from 4 – 5 centuries ago: fruit, vegetables, flowers, vases, etc. If you think A Real Art Lesson will help improve your still life oil paintings, hop on over to Delmus' page so you can make your purchase. If you purchase Delmus' e-book after clicking on a link from this site, Delmus will send me a commission as a way of saying thanks for recommending his how-to oil painting book. I only recommend quality products that I would use myself, and after spending a lot of time poring over Delmus' oil painting instructions, I can honestly say his e-book is a worthwhile investment for those who want to take their oil paintings to the next level. The proof is in the pudding: just check out Delmus' paintings and then ask yourself, "Do I want to learn how to oil paint like this?" If you want to know more about Delmus, check out this interview where he let me ask him a ton of questions about art! Delmus also has a really great site where he teaches easy oil painting techniques, free!